Toulouse-Blagnac Airport flies to Mobile. Airport Toulouse-Blagnac had a really simple need: make the frequent traveller’s life easier. The challenge was to understand the needs and wants of the target audience. Therefore, APPSTUD teams went to meet frequent travellers to identify their feelings concerning the Airport. They noticed that there was a difference between what the airport was theoretically offering and how the traveller was seeing it. The frequent traveller is not necessarily techie but he owns a smartphone. Used to airports areas, he is demanding concerning offered services. He does not have much time, and he considers the airport as a useful but stressful location: come early, don’t be late, optimise the time and be conveniently able to work. 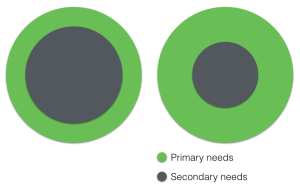 The stress factor decreases the frequent traveler’s secondary needs which are seen a add value for them. The point is, how to optimise the primary needs time (represented in grey below) to spend more on shopping, having a coffee, etc (in green) ? 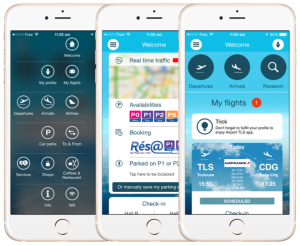 Can an app allow the frequent traveller to give priority to its secondary needs ? Detect weather at the arrival and anticipate real time traffic (so the time needed) between the airport and your locations (current location, home, office). Have a complete overview among relevant information on airlines. Know the waiting time on each checkpoint at the airport. Enjoy an unlimited and free WiFi from the app. Geo-locate your parking lot and easily find it after return. Have a complete overview on shops, restaurants, etc and know their locations. A better user interface which allows the user to access the information conveniently from any situation (being sit, in a car, walking). Making user experience a priority, technological choices naturally came to native languages (Objective-C and Swift for iOS and Java for Android). SCRUM methods have been chosen to bring remarkable functional results to each project iteration. Concerning people involved, a 4 mobile engineers team plus a Scrum Master have been sought. 2 iOS and Android engineers supported by 2 back us engineers have led to the current design. 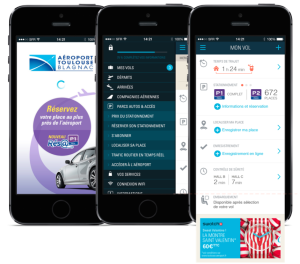 Being constantly in its users’ pockets, Toulouse-Blagnac Airport asserts his leadership in customer relationship.